Two weeks before her wedding, Sylvia is confronted in her opulent, West Village apartment by her fiancee's sexually confident mistress, Teddy. As their respective male partners arrive, the four charged lovers (and a pizza man) clash over love, lust, and intimacy in a comical prism of betrayal and psychological warfare. BAREFOOT features Kate T. Billingsley, Elissa Klie, Judah Tobias, Will Rosenfelt, and Trent Cox. The play includes production design by Alex Haney. 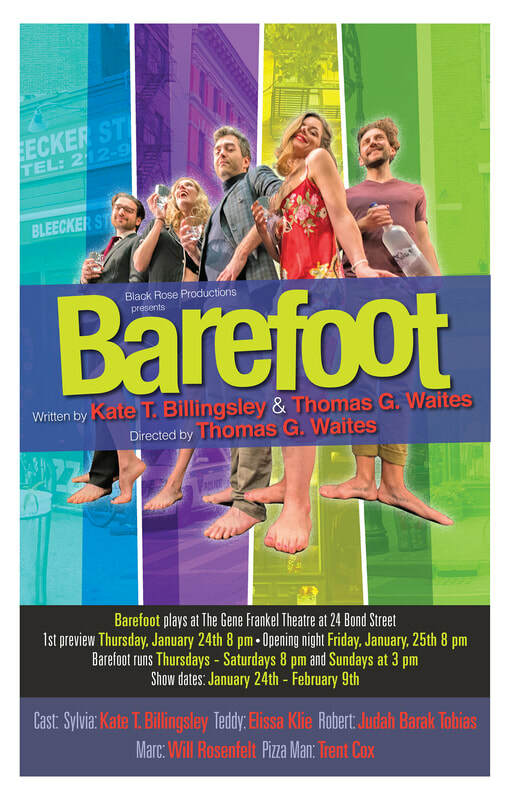 "In the intimate off-off Broadway Gene Frankel Theatre, there are many laughs to be had in this play..."
"Barefoot grabs the viewer right off and propels you through the evening." Kate T. Billingsley is an actress and playwright based in New York City. She received her B.A. from Emerson College with a major in Acting, along with her M.F.A. from The Actors Studio Drama School at Pace University, where she is now a professor of Improvisational Movement and Basic Acting Technique. Kate is a Lifetime Member of The Actors Studio and a recipient of the Theater Hall of Fame’s 2018 Emerging Artist Fellowship. Kate’s playwriting credits include: Bernadette and Sandy (The Collective: Staged Play Reading Series), A Man of His Time (developed at The Actors Studio), Mint Julep (Emerson College), The Living Room, American Rot and now, Barefoot. Her play, A Man of His Time, based on the legacy of the Dred Scott Decision, is currently being expanded into a full-length play. The short can be heard on Playing On Air, a radio podcast program; the episode featuring A Man of His Time was directed by Estelle Parsons and stars Sam Waterston and John Douglas Thompson. Thomas G. Waites is an American actor, director and acting instructor. He founded the TGW Acting Studio in 2000, coaching countless actors including Alfred Molina, Vinnie Pastore, Vinessa Shaw, and Oliver Hudson. As an actor, he starred opposite Daryl Hannah in the film The Clan of the Cave Bear as well as in ...And Justice For All, The Thing, Light of Day, and The Warriors. Waites made his Broadway debut in Teaneck Tanzi opposite Deborah Harry and Andy Kaufman. Other Broadway credits include Awake and Sing! with Frances McDormand and Harry Hamlin, King Richard III starring Al Pacino, and Howard Korder’s Search and Destroy. Off-Broadway he appeared in Clifford Odets’ Paradise Lost opposite Geraldine Page, Alan Bowne’s Forty-Deuce, and David Mamet’s American Buffalo. On TV he has been seen in “Buffy The Vampire Slayer,” “The Equalizer,” “Kojak,” and “Miami Vice.” He has directed numerous Off and Off-Off Broadway plays including the long-running hit Six Goumbas and a Wannabe. Waites directed Joe Mantegna and Frances Fisher in the short film, “Pandora’s Box,” for which he won Best Director in the Atlantic City Film Festival. Lafayette -- accessible from B,D,F,M trains at Broadway/Lafayette or the #6 at Bleecker.